Thank you for sponsoring the eMetrics Summit! We are excited to have your support and want to make sure that your sponsorship is a rewarding and enjoyable experience. The Exhibitor Center page is here to help you easily promote your presence as a sponsor at the eMetrics Summit to your network and potential clients. These tools should help you focus on reaching the targeted group of professionals that the eMetrics Summit brings together so that you can have meaningful conversations at the event and collect quality leads. Promote your discount code to your prospects and customers and be rewarded for your efforts. After only 2 registrations (using your discount code), your company will be rewarded $150 off per attendee. If your outreach returns 10 paid attendees, then your credit equals $1350! Credits can be used toward unpaid invoice balances, additional registrations, 2015 sponsorships, or additional sponsorship opportunities for current participating event. Please request your discount code by contacting Crystal Prag at cprag@risingmedia.com. Credits and refunds will not be applied to registrations or invoices that are currently paid in full. Registrations using your code must be paid and confirmed before May 8th, 2015 to qualify for this reward. Get Started Spreading the Word! 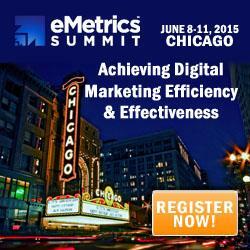 Use the images below to promote your presence at the eMetrics Summit. Copy and paste the HTML and add it to your site in order to link the logos, badges, and banners. Also, feel free to incorporate these graphics into your emails, blogs, social media posts, and other communication platforms. If you are interested in sending a co-branded email, containing a special eMetrics Summit discount code to your list, please let us know and we will create a customized HTML that you can send to your prospects and customers. Please email Crystal Prag at cprag@risingmedia.com to request your custom email HTML file. Increase your reach! Deploy the co-branded email piece to your contact lists and be sure to customize your company information and dedicated discount code. The more of your contacts that register for eMetrics using your discount code, the bigger your reward! Use these sample tweets to gather eMetrics Summit attendees around your booth so you don’t miss the chance to connect with them. Many of your followers may be just one face-to-face conversation away from turning into hot leads. Double your reach! Use our Twitter handle @emetrics and official hashtag #emetrics in your tweets and we will re-tweet it to our followers. Utilize these sample Facebook posts in order to alert your Facebook community that you will be exhibiting at the eMetrics Summit. Facebook is full of eMetrics Summit attendees for you to reach! Double your reach! 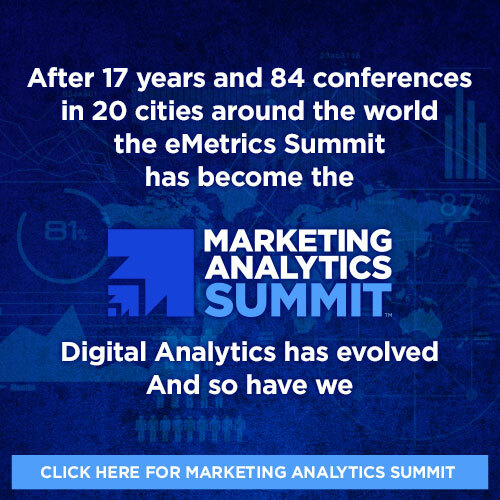 Tag our Facebook page, eMetrics Summit, in your post and we will re-share it on our page as well. Join the conversations and discussions on our LinkedIn Group page for eMetrics Summit. Add your own comments to the page to make sure LinkedIn connections will stop by your booth at eMetrics Summit. Don’t forget to join the group page yourself! Does your company have an official blog? If so, send us any entries relevant to eMetrics Summit topics which are tied to your event presence and we’ll promote them for you via the eMetrics Summit social media channels. Posts should be informational and insightful rather than strictly promotional. Please send all blog postings to Crystal Prag at cprag@risingmedia.com for approval. We’ll notify you when they’ve been approved. Double your reach! Once we promote your post on eMetrics social media channels, don’t forget to re-tweet or share with your communities! If you have any questions about exhibitor marketing opportunities, please contact Crystal Prag at cprag@risingmedia.com. If you have any other questions specifically regarding your sponsor guidelines, contracts, order forms or delivery instructions, please contact Chrissie Cinquegrano at ccinquegrano@risingmedia.com.